On any given day, Gerard Orozco is juggling any number of projects across the country. But he loves the adrenaline rush that goes along with being part of a corporation with twenty-five thousand people around the globe. For over ten years, Orozco has been at CH2M, a company currently in the process of being acquired by Jacobs Engineering. As a senior vice president and key account executive, he tackles everything from government infrastructure projects to private industry challenges. 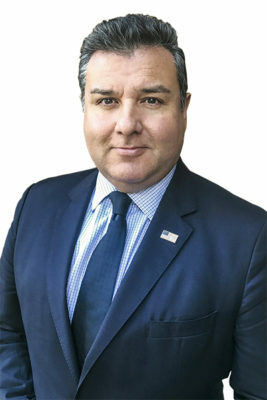 He is known in political circles as a connector and sophisticated deal maker; it is not unusual for Orozco to be called on by US representatives, governors and mayors for advice. In his native city of Los Angeles, he often works closely with Mayor Eric Garcetti and his team on complicated local projects. As a senior vice president, Orozco is also in charge of expanding the company’s team. The SVP is particularly interested in hiring women and people of color—especially in Los Angeles. The city is more than 50 percent Latino and known for its vibrant diversity. Orozco says the workforce should reflect the city it serves. When the Los Angeles mayor calls on CH2M, he knows he’s going to get a diverse team that brings a lot to the table and Orozco knows he’s going to get the most accurate answers and solutions for the city’s most challenging issues. Make no mistake: while there is something glamorous about running to City Hall in downtown Los Angeles for a meeting, the work is challenging. “I can’t deny that there are times when we face great challenges, but solving problems is what my team thrives on,” Orozco says. While he’s not shy to make what he wants known, or to ask for what’s needed, his leadership style is relaxed. Orozco believes in hiring the right people for the job and simply trusting that they will meet all expectations once they are given a clear direction and armed with the right information. Moving forward, Orozco and his team are working on a number of high-profile projects, including reforming the trash hauling system in the City of Los Angeles. The system comes complete with aggressive recycling goals that will help create a more sustainable future for the city. Another major project that’s generating a lot of buzz in Los Angeles is the company’s involvement in helping automate the city’s Hyperion Water Reclamation Plant. This will be the first time in history the plant is automated, and Orozco is proud that his team was behind the initiative. Orozco isn’t intimidated by such high-profile, demanding projects. He sees them as both a challenge and an adventure.